Having stored too many notes and contacts on iPhone but don’t want to clear them? Want to backup them to computer but can’t use iTunes/iCloud? Here introduce a easy-to-use tool to backup your important notes and contacts on iPhone without iCloud or iTunes. 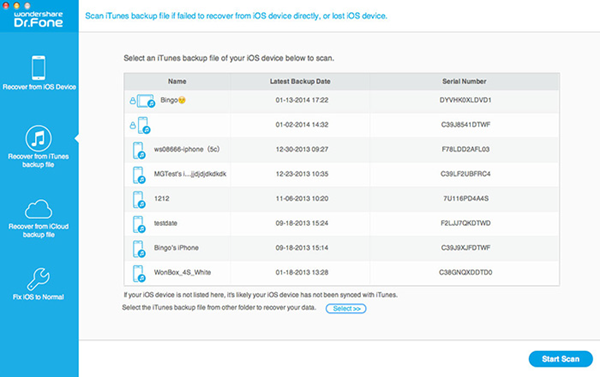 Although iTunes and iCloud can help you backup iPhone, not everyone like to apply it. A tool called iPhone Data Recovery can extract data on iPhone to computer with just three clicks. With it, you not only can backup your iPhone notes and contacts to computer, but also can selectively backup the data. After all, there maybe some notes and contacts that you won’t use again. Wondershare Dr.Fone for iOS for Mac and the Windows version are good choice for those who want to copy notes and contacts on iPhone to computer directly from the devices. It supports iPhone 6S(Plus)/6(Plus)/5S/5C/5/4S/4/3GP and iPad, iPod Touch. Except notes and contacts, it also can backup message, reminders, call history, WhatsApp history, FB Message and calendar from iPhone directly. How to backup notes and contacts from iPhone to computer? The steps are suitable for both Mac and Windows products while the snapshots is just based on Mac. Install and run the program on Mac. Then connect your iPhone to the computer through its equipped USB cable. The program will detect your iPhone automatically and shows you the window for “Recover from iOS Device”. Tips: Before run the application, make sure you have downloaded the latest version of iTunes. To avoid automatically syncing, don’t launch iTunes when running iOS Data Recovery. Here, you are advised to disable the automatically syncing in iTunes beforehand: Launch iTunes > Preference > Device, check “Prevent iPods, iPhones and iPads from syncing automatically”. If your iPhone is iPhone 4, iPhone 3GS, you can switch to the “Advanced Mode” through the button at the lower-right corner. After then follow the instruction in the window to enter device scanning mode: Hold your device, then click the Start button > Hold the Power and Home buttons at the same time for exactly 10 seconds > Release the Power button but keep the Home button pressed. Tap the “Start Scan” button, the program will start to scan your iPhone to find the data. When the scanning process is over, a scan result with both lost and existing Data on your iPhone will be displayed in categories. You can preview the found data on its file type by clicking the “Memos & Others” > “Notes” and “Contacts”in the left side. Step 3: Export contacts and notes from your iPhone. When you find the notes/contacts you need, select them by putting a check mark in front of the box. After that, hit the “Recover” button at the bottom right of the window. And the data will be saved to your Mac by default. Actually, the app is even treated as a recovery tool. That means if you delete some data on your iPhone, it can find the data back from iPhone, if you have iTuns/iCloud backup, it can recover up to 19+ file types. How to Recover Deleted Christmas Messages from iPhone? 2015 Christmas just left us several days ago. 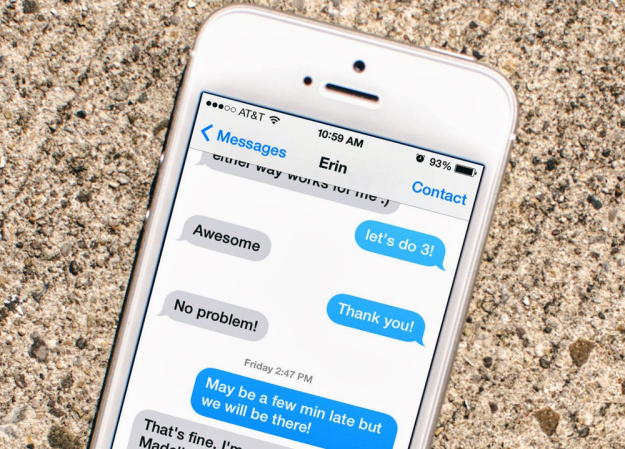 You may stored so many blessing messages on your iPhone. As a good housekeeper you may be used to delete some old text messages. But when you cleared some Christmas message, you probably then realized that you deleted some that you didn’t mean to delete originally. Well fear not. 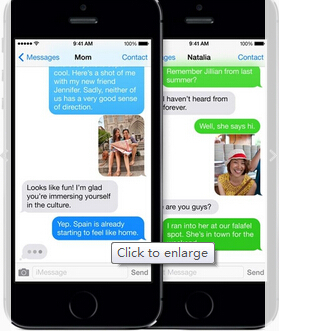 You can recover deleted Christmas text messages from your iPhone. Indeed, it’s possible you can do so without having recourse to anything more difficult than restoring from backup. And at worst you may be able to get those messages back using a third app - iPhone Data Recovery tool. Wondershare Dr.Fone for iOS for Mac is one the best programs I have used. It can scan and retrieve your Christmas Messages from iPhone directly, or simply restore your iPhone Messages from the iTunes/iCloud backups, too. Besides, it is 100% safe that without data loss and personal information leak. This iPhone Data Recovery tool is compatible with iPhone 6s/6s plus/6/6 plus/5s/5c/5/4s/4/3GS. For Windows users, please use the Windows version. How to recover deleted Christmas message on iPhone? Connect your iPhone to Mac with USB cable and launch the iPhone Data Recovery tool. Choose “Recover from iOS Devices” and then click “Start Scan” to scan lost Christmas Message from iPhone. I. For iPhone 6/6 Plus/5S/5C/5/4S user, you can “Start Scan” button directly to scan your iPhone, and then a scanning window will be shown. 1. Hold your iPhone and click “Start” button on iPhone. 2. Pressing “Power” and “Home” buttons for 10 seconds. 3. After 10 seconds, release “Power” button, but still hold “Home” for another 15 seconds. After scanning, all the files on iPhone including Messsage are displayed on the interface. You are allowed to preview all kinds of files before recovery. Select your deleted Christmas message and Click “Recover” to start to recover lost Messsage from iPhone and specify a location on your computer to save the recovered iPhone Messsage. Actually, when you see the data displayed on the list, you should know that the software is a tool to help you recover any iPhone data, including notes, contacts, photo, reminders, etc no matter from iPhone itself, or iTunes/iCloud backups. It also is a way to backup your iPhone to Mac without needing iTunes. Data loss on iPhone/iPad often occurs from time to time. So backup your iPhone/iPad is necessary so that you can get your important data back when you dropped your iPhone to water, broke your iPad carelessly or upgrade to iOS 9. Thankfully there are many ways to store your information on the web or your PC or Mac, all of which are free and easy to use. Method 1: Back up an iPhone/iPad: Creating an iCloud backup? 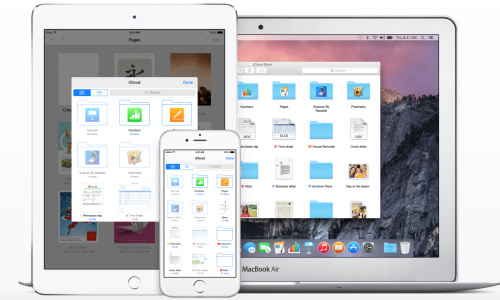 One of the simplest ways to back up the data on your iPhone is to use Apple’s own iCloud service. 1. Get an iCloud account with your Apple ID. 2. On your iPhone/iPad go to Settings > iCloud > Backup and you’ll see the option to toggle on iCloud Backup. That’s it, you’re good to go. Now your phone will automatically look after your data without any need for you to get involved. 1. Plug your iPhone into your computer and open up iTunes. 2. Select File > Devices > Transfer Purchases. This will save all of the content you’ve purchased via the App Store or iTunes Store on your computer. 3. Wait for iTunes to finish transferring your purchases. 4. Select File > Devices > Backup. 5. iTunes will begin backing up your device. Depending on how much data you’re backing up, this could take some time. 1. Download the Google Drive application for Windows or Mac. 2. Run Google Drive. It’ll ask you to sign-in and then run you through a fairly short setup wizard. Follow the steps, and click “Done” once you’re finished. 3. Google Drive should now be on your computer and the Google Drive folder it created will automatically open via your native file explorer. Wondershare Dr.Fone for iOS (Mac) is a free desktop backing up program. You can back up everything on your iPhone or iPad to your PC/Mac just with 3 click. And it is free. 1. Run Dr.Fone for iOS and connect your iPhone/iPad to your PC/Mac. 2. Choose “Recover from iOS devices” then click “Start Scan”. 3. When the data is listed on the left according to the categories, you can choose all then press on “Recover” to store the data to Mac/PC. There are too many ways to make you backup your iPhone/iPad in case the data loss. Of course, you can only backup some photo, contacts instead of the whole data in your iPhone/iPad. How to Recover Deleted iPhone Pictures? How to Retrieve lost Message after Replaced Phone? 1. 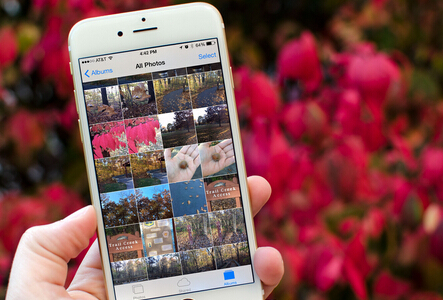 Launch the Photos app on your iPhone or iPad running iOS 8 or later. 2. Tap on the Albums tab in the bottom navigation. 3. Tap on the album titled Recently Deleted. 4. Tap on the photo you’d like to recover and tap on Recover in the bottom navigation. 5. Tap on Recover Photo in the popup menu. However, this way is only effective in 30 days. If it exceeds 30 days after you delete the picture, you won’t get the photo back as the above method. But if you have iTunes backups, you can recover the picture in another way by aniPhone Data Recovery tool. You can choose to use Wondershare Dr.Fone for iOS for Mac. It can help you to extract the deleted photo from iTunes backups on Mac fast. Actually, it can make your iTunes backups readable on Mac so that you can retrieve any data, such as contacts, call history, notes, etc from the backups. Step 1: Run the iPhone Data Recovery tool on Mac and choose “Recover from iTunes Backups”. Step 2: Click “Start Scan” to scan your iTunes backups on Mac. And later, your data on your Mac will be displayed according to the data categories. Step 3: Simply press on “Recover” to store the iTunes backup to Mac. If you just need to check certain data on Mac, you can preview the data and choose the file type to recover. If you restored all your iTunes backups to Mac, you not only can retrieve the deleted picture, but also any other deleted/lost data, like message. In this case, if you didn’t restore your iPhone 6, you can recover the lost message from iPhone 6 directly since any new data add on iPhone 6 can restore your iPhone 6 and make you can’t find the message back any more. Or if you have ever enabled automatic backing up with iTunes, there should be an iTunes backup file for your new iPhone 6, you can recover the lost messages from your iTunes backup file. But if you directly recover the lost message from iTunes, your current data on iPhone 6 will be covered by older iTunes backup. So you need to selectively recover lost message from iTunes. No matter you want to recover the lost message from iPhone 6 directly or selective get the message back from iTunes backup, both of the cases need a third party tool - iPhone Data Recovery tool. > Install and run Wondershare Dr.Fone for iOS on your computer. Note: Wondershare Dr.Fone for iOS for Mac is available for both Windows and Mac, please choose the right version to download and install. > Connect your iPhone 6 to computer. > Click “ Start Scan” on the startup interface after being recognized. > Choose messages to scan and analyze selectively. > Wait until the data analyzing process completes. > Select the deleted messages and then click “Recover to Device”. > Install and run Dr.Fone for iOS. > Select an iTunes backup file from which you want to extract all your messages only. > Wait until the messages and contacts analyzing is finished. > Preview all the extracted messages and select what ever you need to recover to computer or recover to your device directly. 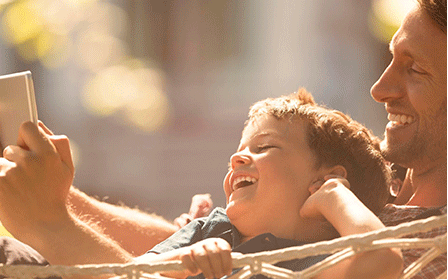 If you want to recover other data like notes, reminders, you also can follow the way. You should be aware that iTunes backups on Windows and Mac are unreadable. That’s why we can’t check the latest iPhone data directly backups on Mac. When we need to recover data from iTunes backups, we need the help of iPhone Data Recovery tool instead of restoring the data selectively from iTunes backups directly. How to check iTunes backups on Mac? Step 1: Run the iPhone Data Recovery tool on Mac and choose “Recover from iTunes Backups”. If you need to check your iCloud backups on Mac, you can choose recover from iCloud backups mode. This way is also suitable for iPhone data recover. That means that if you lost your contacts, message, notes on your iPhone, you can recover them from iTunes without needing to connect your iPhone to Mac. iPhone users should know that we can restore our iPhone data from iTunes backups easily. But this behavior means that your current data on iPhone will be erased by older iTunes backups. So if you just want to selectively restore an SMS conversation you have deleted by mistake, you have to need the help of iPhone Data Recovery tool. 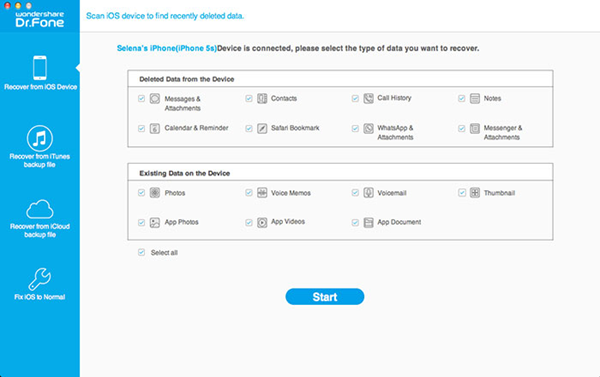 Wondershare Dr.Fone for iOS for Mac is a nice iPhone data recovery tool on Mac. It can extract the iTunes backups of iPhone selectively. So you can just retrieve your deleted message from iTunes backup to iPhone. How to selectively recover deleted SMS on iPhone from iTunes? Step 1. Launch iPhone Data Recovery Tool on Mac > Connect your iPhone to computer with USB cable> Select Recover from iTunes Backups. Step 2. Click “Start Scan” button to start to scan your iTunes backups on Mac. Step 3. Preview the data displayed on the left. Choose “Message” file option. View the deleted messages, and choose the text messages you want to retrieve, and then click the Recover button on the bottom-right of the window. If you didn’t have iTunes backups and you didn’t add new data to iPhone, you also can recover the deleted message from iPhone directly. Just choose Recover from iOS Device recovery mode in the step 1. How to Restore iPhone/iPad Deleted or Lost Data from iOS 9 Update? 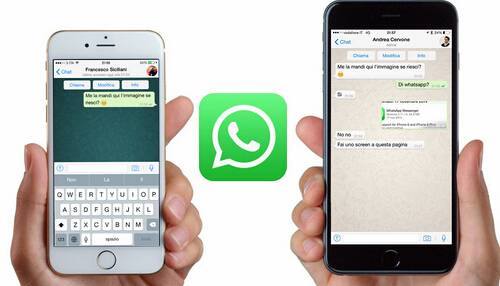 We know that we can sync our iPhone 6 to iTunes to make a WhatsApp message backup on Mac. However, the backup is unreadable. So we need a tool to help you make the iTunes backup readable on your computer. Besides, iTunes, you also can email your WhatsApp message to Mac and read it. Now, we show you the two ways to make WhatsApp readable backup one by one. 1. 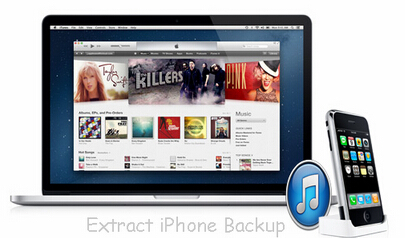 Download Mac Free iPhone Backup Extractor(Windows version). The freeware allows you to extract WhatsApp messages from iTunes backup. You can save and view the chat history on your Mac with a single click only. 2. Run the software and choose “Recover from iTunes Backups” after you have backed up all your WhatsApp message to Mac. 3. Click “Start Scan” to deeply scan your iTunes backup on Mac and later the data will be displayed according to the categories. 4. Choose “WhatsApp” on the left list and hit “Recover” to store all the WhatsApp message to Mac then you can read it anytime. Backup iPhone WhatsApp messages to Mac via email will have a simple process to follow. 1.Open the WhatsApp conversation you want to save. 2.Tap the contact’s name or group subject in the navigation bar. 3.Scroll to the bottom and tap Email Conversation. 4.Select if you want to Attach Media or email the conversation Without Media. 5.Enter your email address and tap Send. Your chat history is attached as txt file to this email. 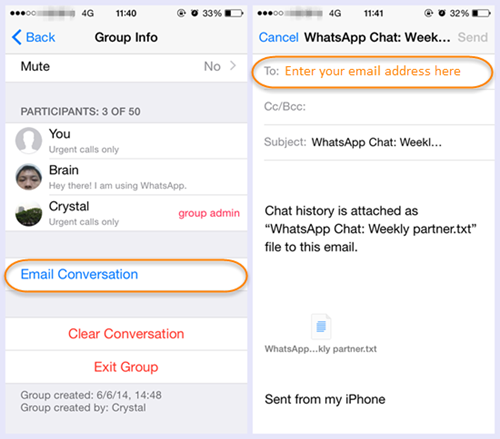 6.Log into your email account on computer and view your WhatsApp chats. You can any way to help you backup WhatsApp messages from iPhone 6 to computer. For those who haven’t sync iTunes to iPhone 6, this app also can scan your iPhone directly once you connect your iPohne 6 to Mac with USB cable and extract the WhatsApp message from iPhone 6 to Mac even you lost or deleted carelessly the WhatsApp message, it can help you recover it. Just download one and try! How to Find Safari Bookmark Back on iPhone? Erasing all content and settings will delete all of the data from your device, including songs, videos, contacts, photos, calendar information, and anything else. All device settings are restored to their factory condition. If you erased your old iPhone 6 to make room but sadly found that you have some important messages that can’t be deleted, in this case, how can you recover the lost message after you erased your iPhone 6? General speaking, when you delete data from your iPhone 6, it isn’t gone forever immediately, but only becomes invisible and can be overwritten by any new data. As to erasing iPhone 6, it’s a little hard, because the data might have been overwritten during the restoring. It sounds impossible to recover the message from iPhone 6 after erasing all the data. Actually, there is still a chance. All you need is an iPhone data recovery tool. How to recover the lost message after erased all the data on iPhone 6? 1. Run the program and choose “Recover from iOS Device”. 2. 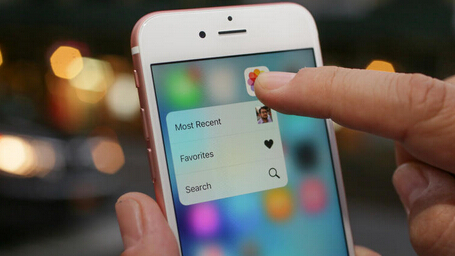 Click “Start Scan” to deeply scan your data on iPhone 6. 3. When the scan stops, you can preview and selectively recover any item you want from the scan result to your computer. It’s can be done in one click. Note: In this way, it not only can recover the lost message but also can recover contacts, notes, reminder, call history, WhatsApp history, calendar, FB Message from iPhone 6 directly without backups. 1. Launch the program and choose “Recover from iTunes Backup”. 2. Choose the backup file from the list displayed by Dr.Fone, and click “Start Scan” to get it extracted. 3. Once the scan process ends, you can preview and selectively recover any item you want from the scan result to Mac. Note: In this way, you can not only recover data existing in the iTunes backup, but also recover those deleted data, which can’t be restored directly from iTunes to your iPhone 6. 1. Run the program and choose “Recover from iCloud Backup”. 2. Log in your iCloud account. Choose the backup file you want to download and extract it. 3. Check the backup content and tick to recover the item you want to your Mac. Note: It’s totally safe to log in your iCloud account and download the backup file. Dr.Fone won’t keep any record of your information and data. The downloaded file is only saved on your own Mac and you’re the only one to access. You can choose any recovery mode to get the lost message back to your iPhone 6 according to your situation.